STUDY DESK – Premium height adjustable study table for kids that will keep the little ones motivated for studying and learning. Premium and modern design that will brighten up their rooms. GROWS WITH YOUR CHILD – Height adjustment of about 8 inches ensures this study and activity table grows with your child. Ample desktop space with 39 inch wide and 28 inch deep surface area. 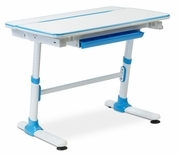 HEIGHT ADJUSTABLE STUDENT DESK – Easily increase the height of the desk with the crank mechanism. Height can be adjusted between 23.25" to 31.25 inches. Crank handle can be tucked away when not in use. TILTABLE DESKTOP – Adjustable desktop tilt mechanism provides the perfect angle for writing, reading and drawing. Up to 25 degrees of tilt prevents slouching and promotes healthy posture. Rubber safety stops and locking mechanism prevent pinching. DRAWER FOR STORAGE – Drawer helps store school supplier and help with clutter-free rooms. Multi-function hook to hold school bags. Heavy-duty castors help move the desk around.